Audley Harrison says he is not interested in fighting David Haye, and has targeted a world title shot against one of the Klitschko brothers should he beat Albert Sosnowski to claim the European heavyweight title. The 38-year-old clung on to his professional career by winning Prizefighter Heavweights III in October, and his reward is a shot at Sosnowski's European title at Alexandra Palace on April 9. Former Olympic champion Harrison is now convinced that his long-ridiculed dream of becoming a world heavyweight champion can come true with a victory over Poland's Sosnowski in April. Although he insists he is not looking past Sosnowski, Harrison says he would target a world title fight should he win, but it would not be compatriot Haye's WBA belt he would be interested in. "I'm not interested in David Haye," Harrison said at his pre-fight press conference at The Dorchester. 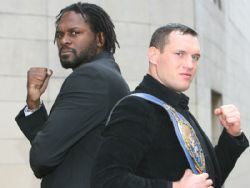 "All I'm interested in at the moment is Albert Sosnowski and he will not give up that belt easily. The worst thing I could do is look past Albert. If I can't get past him then there's nothing in the future. "The heavyweight division is desperately looking for marquee names and, no disrespect to David Haye, but no one in the US is talking about David Haye. They're all talking about the Klitschkos and no one is giving David Haye any play as a World Champion so the guys I want to fight are the Klitschkos. "If you get a chance against David Haye then people will say 'you now have to beat the Klitschkos', so if I beat Albert, I want the Klitschkos." Harrison says he almost walked away from boxing during his darker days of four defeats in eight fights, and he says he has had to come back from being a 'broken man' to fight for the European title. "I have a personal mission to be a world champion. Call me delusional or crazy but I call it reality," added Harrison. "When my contract with the BBC ended I lost my feel for boxing and the passion for boxing died. I was a shell and I had no desire. I was a totally broken man and it took a long time to recover from that. "I had certain characteristic flaws but it's been part of my learning and journey. I wasn't ready to be the next Lennox Lewis in 2004 and it was almost a blessing that I lost as I had a chance to grow through adversity. "I've been through so much in my career but I'm still here, still believing, still persevering and that's what character is. My moment of destiny is really close but I have a real obstacle in front of me." Harrison says the show will finally be over if he fails to beat Sosnowski, but is calling for the home crowd to spur him on. "If he beats me to a pulp then I will know it's over," he added. "If Albert Sosnowskis beats Audley Harrison fair and square then there will be no excuses as I'm 100 per cent physically, mentally and spiritually ready to win. "Albert has been beaten before so there's a blue print to beat him. With my skills and my ability you will see why I won an Olympic gold medal and why I was 19-0. "I want to get my London fans in their St George's T-shirts and I want to get nostalgic and hear chants of 'Audley', 'Audley', 'Audley'. I want to hear the fans of boxing, the fans of Audley, the fans of perseverance and the fans of overcoming adversity and get back to boxing."